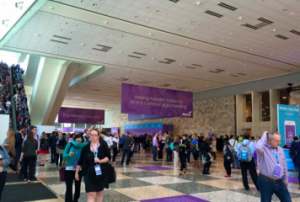 Conference season is in full swing, and I’m excited to see old faces and meet new ones. No matter your role at these events, they begin before they even start. In other words, you’re preparing for your conference days, weeks and even months ahead of time. If you’re sponsoring, you’re creating materials, promotion strategies, and booth swag. If you’re speaking, it’s all about writing and rehearsing a killer presentation. (Always strive for your next presentation to be better than the last.) If you’re attending, you want to make the most of your time, and create your own agenda. You want to find out who will be there, so you can schedule key meetings, register for the best parties, and attend the most relevant sessions. Before all of this, you have to determine if you can attend. Is there too much happening at work? Can your significant other hold the fort with a smile? Attending a conference doesn’t just affect you, it affects the people around us. We’re out of the office and need coverage. We’re away from home, and need someone to get the kids off the bus, walk the dog, and mow the lawn. The decision to attend events may not always be our choice, but when it is, there’s a lot to weigh. I always talk to my husband first, but I have a few key events that I love to attend each year, and we plan them in advance. We have a shared Google Calendar that we block with each of our favorite events — personal and professional — so that we can cover and support each other. During the show, you’re completely enveloped in that world around you. From expo halls, to sessions, to parties, it’s a whirlwind of people and events. You’re sitting, standing, walking, and walking…and walking. Sometimes you forget to eat or drink for hours, and you can’t remember the last time you sat down, went to the bathroom, or had a drink of water. With session after session, there isn’t much down time to check in at work or call your family. You could easily go the entire event without contacting either of them. However, it’s important to make time for both. My agenda may be packed with all of my favorite sessions, but I’ll skip one or two to use those 45 minutes to check work email, talk to my coworkers, and make sure I’m touching base. Typically, there’s a small break between breakfast and the start of sessions in the morning. There’s also a small break after the sessions are over for the day, and before the evening activities. I use this time to call and text my husband. I love to hear the voice of my kiddo, and the bark of my dog. I make sure my husband is well, and I hear stories about his day. These breaks are crucial, and while my husband would understand if we didn’t speak for the show’s duration, I truly want to make time for this. Once the event is over and you’re en route home, reality starts to flood back in. Your notepad is full, your iPhone is dead, you’ve got a big bag of laundry to do, and somehow, you have to digest the information overload, also known as your conference experience. Even more, you have to share your insights with your team, and apply them. Hopefully the conference was engaging, exciting, and inspiring, so that you’re enthusiastic about bringing all of your new found knowledge to the table. I use the plane ride home to start crafting my next steps and notes. If I lack WiFi, I draft emails and blog posts in Word docs, and I plan the meetings that I need to schedule, including the agenda and who should attend. After a few hours of this work, I take a look at my phone and scroll through pictures and videos of my family. It psyches me up for the moment I drop my bags on the kitchen floor and open my arms for a running hug from my son and dog. Then, over a glass of wine, my husband I recap the week, sharing pictures and stories. They say distance makes the heart grow fonder, and after a long conference, that couldn’t be more true.